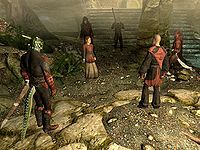 Babette is a Breton vampire with a youthful appearance, who works as an assassin for the Dark Brotherhood. 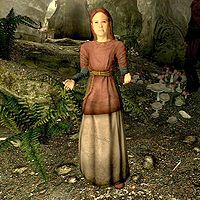 Despite her appearance, Babette is the oldest member of the Dark Brotherhood's Falkreath sanctuary. Babette is the master-level trainer in Alchemy, and can sell you many potions, ingredients, and recipes. Like the other Brotherhood members, she offers her opinions on your contracts. Once you have been introduced to the Brotherhood during Sanctuary, you can ask the members about themselves, and each other. Festus Krex tells you to... "Talk to Babette about potions. She's the creepy little girl - can't miss her." She is also one of the few NPCs that sells daedra hearts as a regular product, and often will have one or two in her inventory. When asked for Alchemy training she will say: "It's as rewarding as it is dangerous. Let's see what I can show you." She spends all of her time wandering around the Sanctuary, preferably near her alchemy lab, occasionally eating, sleeping or relaxing on a chair. After the quest Death Incarnate, she will move to the Dawnstar Sanctuary. She wears child's clothes and shoes. She is loyal to all of her fellow assassins in the Brotherhood: Arnbjorn, Astrid, Cicero, Festus Krex, Gabriella, Nazir, and Veezara. If you approach or come near her, but do not initiate dialogue, she will comment: "I could brew some potions for you. Or train you in Alchemy. ", "You looking to buy some potions? Or maybe I could help train you to make your own? ", "Brother/Sister." or "What do you hope to find? Sweets and my dolly? Or maybe some of my spare Nightshade?" (if she catches you sneaking near her). As with all Dark Brotherhood members, she will also partake in the radiant conversation system found here. Her three unique responses once again show how she uses her appearance to her advantage: "In truth? It was so easy, I feel a bit guilty. Once again, the sweet, innocent child earned more trust than was wise. ", "You give me too much credit. For how could I fail? I am, after all, just a little girl. What threat could I possibly pose? He he he he he." and "I am the perfect weapon. My innocent, childish form grants me nearly unrestricted access. Poison or a good bite usually takes care of the rest." When you exit conversation with her, she will bid you farewell with one of the following: "Have fun! ", "Can't wait to hear all about the next person you murder. ", "Have a good contract. ", "Until next time, brother/sister. ", "Kill well. And often." While she looks like a ten year old girl, Babette is in fact a three hundred year old vampire. She was bitten as a child and, as a result, retained her childlike appearance. She uses this to her advantage in her contracts; her targets do not perceive her as a threat, and she often plays the part of a scared, lost little girl to gain their trust. One such example is when she remarks that "I'm just a little girl! The Dark Brotherhood killed my mama and papa, and then they took me captive! Please, please help me! Rather convincing, don't you think? In truth, I'm no more a little girl than you are. I was once, of course. Three hundred years ago. Vampirism tends to keep one remarkably... fresh." She will comment on her youthful appearance by saying "Don't let my appearance throw you off. I'm older than you. A lot older. Getting bitten by a vampire when you're ten will do that to a girl. It's been quite a boon, looking like a child. No one ever suspects a thing. My targets make the mistake of not perceiving me as a threat. Last mistake they ever make." Babette is indifferent about the arrival of Cicero and the Night Mother, saying: "Two hundred years ago, I would have lain down my life for the Unholy Matron. But that is an age long since passed. Astrid is my matron now." "Would the sweetie like a sweetie?" and Veezara: "Ha ha ha ha ha ha ha ha ha!" After this scene Babette will speak to you once you are close enough to her, "There you are! Astrid's told me all about you. Heard she pulled the ole' "Choose your victim" gag with you. Ah, I love that one... You're going to love it here. We have a lot of fun, and we look out for each other. Just like any family." At the start of The Cure for Madness, the Brotherhood will be gathered round a wounded Veezara. Babette tries to calm Veezara down, to which the wounded Argonian responds favorably. Astrid and the other members then proceed to inform you of what happened, and what needs to be done. Afterwards Babette and Astrid attempt to bolster Veezara's spirit. If you try to talk to Astrid before her first line below, she will say "You're back. Good. You'll want to hear this." "Just try to relax, Veezara." Astrid: "Maro is dead, I know. But we've got bigger problems right now!" Player: "Gabriella mentioned something about Cicero..."
Astrid: "The fool went absolutely berserk! He wounded Veezara, tried to kill me, and then he fled. I knew that lunatic couldn't be trusted." Festus Krex: "It's true, I'm afraid. Cicero was a little whirlwind, slashing this way and that. It would have been funny, if he weren't trying to murder us all." Astrid: "Look, we've got to deal with this situation. You've got to deal with this situation." Player: "What do you want me to do?" Astrid: "I want you to find that miserable little fool and end his life! But first... find my husband. Make sure he's all right. After the attack, Arnbjorn flew into a rage. When Cicero left... Arnbjorn went after him. They disappeared into the wild. Search Cicero's room. Maybe there's something in there that sheds some light on where he might have gone. Let me know the minute you find something. I've got to see to Veezara, and calm everyone down." "Can you get it open?" During Death Incarnate, you are required to seek safety inside the Night Mother's coffin. Once inside the coffin, you will hear explosions and crashes as the sanctuary comes down around you. After they end, you will hear the voices of Nazir and Babette talking as Nazir tries to unearth you. When Nazir opens the coffin, you find yourself in the main room of the sanctuary. The coffin was thrown through the stained glass window, near where it was situated, by an explosion. After you step out of the coffin and talk to the two survivors, the Night Mother will talk to you once again and inform you that Astrid is still alive. She will ask you to find her. Babette and Nazir will follow you after you inform them of what you've just heard. Babette: "Hurry, Nazir! I'm telling you, he's/she's in there!" Night Mother: "You must speak with Astrid. Here, in the Dark Brotherhood Sanctuary." "By Sithis, what... what happened?" After informing Nazir of the Night Mother's words and instructions, Babette and Nazir will follow you until you find Astrid. As you walk around the sanctuary, Babette will alternate between concern for your well-being, "Nazir told me what happened in Solitude. You poor dear. 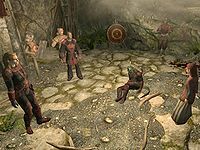 You've been through so much...", and trying to understand what has just happened, "By Sithis, what... what happened?". After finding Astrid, and discovering her final wish, Babette exclaims her pity, "Oh, Astrid...", before revealing more of her surprise after Astrid dies, "If I hadn't heard it with my own ears I wouldn't have believed it. How could Astrid have done this to us? Strangely, I feel only pity for her..."
During this event Hail Sithis! starts. As the focus shifts from the dead to the living, and soon-to-be-dead, Nazir tells Babette to pack up. 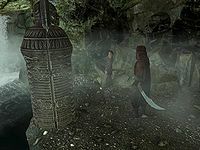 He then takes over the moving of the Brotherhood and the Night Mother coffin to Dawnstar, while instructing you to follow the Night Mother's instructions and head to Whiterun. Nazir: "Babette, my girl - pack your things. We're moving." Mourning Never Comes "You're headed to The Hag's Cure, right? It's a good shop. You should examine their wares. Never pass up the chance to buy a good potion... or poison. And one more thing. Have fun. You'll be committing a dark deed, but there's no reason you shouldn't enjoy yourself. You're only young once. Trust me, I know." Whispers in the Dark "Oh! Well, I hope she doesn't suspect me. I mean, I've spoken with Cicero a bit, and he's quite charming. But I'd never go against Astrid. Never." The Silence Has Been Broken "The man you need to speak with, his name is Motierre? That's a very old and powerful Breton family, firmly established in Cyrodiil. Most curious..."
Bound Until Death "It's no fair. I love weddings. Astrid should have given this contract to me. Instead, she's got me visiting cities, assessing security. How boring. But listen, I think I can help you. The wedding reception is outside the Temple of the Divines, right? In Solitude? If so, the bride will probably address the crowd from the balcony. It overlooks the courtyard. Well, there's an old statue there. I've seen it. Hanging right over where she'll be standing. Old means weak. Weak means it could fall. Hmmm?" Breaching Security "Normally I talk to a victim before I end his life, but I wouldn't recommend it this time. Maro will be alert to danger. Talking may spook him." The Cure for Madness "Cicero destroyed any sympathy I may have had for him when he wounded Veezara. Kill the fool and be done with it." Recipe for Disaster "Yes - don't kill the Gourmet! Oh, I know you have to, but it makes me sad all the same. I love the Gourmet's recipes. The world will soon be a blander, less flavorful place." To Kill an Empire "Don't take any chances with this one. Use the Jarrin Root to poison the Emperor's food. You're disguising yourself as a chef - it only makes sense." The Cure for Madness Between stages 10 and 25 "I believed in Cicero. But he's betrayed us all." "Go. Do what has to be done." 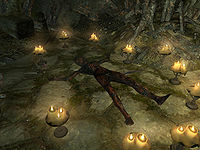 Death Incarnate Stage 60, near Astrid "By Sithis, what... what happened?" Stage 60, far away from Astrid "Nazir told me what happened in Solitude. You poor dear. You've been through so much..."
After Stage 80 "If I hadn't heard it with my own ears I wouldn't have believed it. How could Astrid have done this to us? 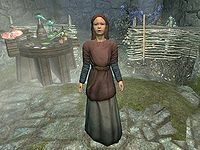 Strangely, I feel only pity for her..."
Hail Sithis! Before Stage 200 "I'll admit, I'm having trouble coming to terms with all of this. I'll just follow Nazir's lead." Quest Complete "Do you need alchemy components? Or training?" "I like it here. We should have moved to Dawnstar ages ago." Quest Complete, Cicero is alive "So... wait. Cicero is alive? And we're all friends again? I swear, I can hardly keep up..."
Quest Complete, Services are available "You know, I can still sell you some potions and such, or train you in alchemy." Honor Thy Family Evicted from family "When you disrespect your Family, you disrespect yourself. Don't you care for anything at all? Prove that you do - speak with Nazir, make reparations." †This dialogue will only be spoken if the quest stage of Hail Sithis! is at least 2000. However, the highest quest stage is 255, so this dialogue is never activated. "Listener! Fancy seeing you out here." "I am sure Nazir's cooking is great and all, but my appetites are a little more... discerning." "You could call it that. Didn't put up much of a fight but made for a tasty snack. A rich bouquet of flavors, I would definitely recommend it." She will move along after the conversation. If you talk to her again, she will tell you, "I must head back to the Sanctuary before dawn. I will see you there, Listener." This is the merchandise found in Babette's merchant chest. These items are only available if purchased from the merchant; they cannot be pickpocketed or stolen. They are restocked every two days. Though she is an adult according to her dialogue, the game still categorizes her as a child NPC; thus, she can not be harmed. Babette won't be in the sanctuary if you choose to destroy the Dark Brotherhood during the first meeting with Astrid. Babette also appears in Legends, as a card added in The Fall of the Dark Brotherhood storyline. This page was last modified on 23 October 2018, at 12:17.